The 2010 World Science Festival began tonight with a gala celebration at Avery Fisher Hall in Lincoln Center. 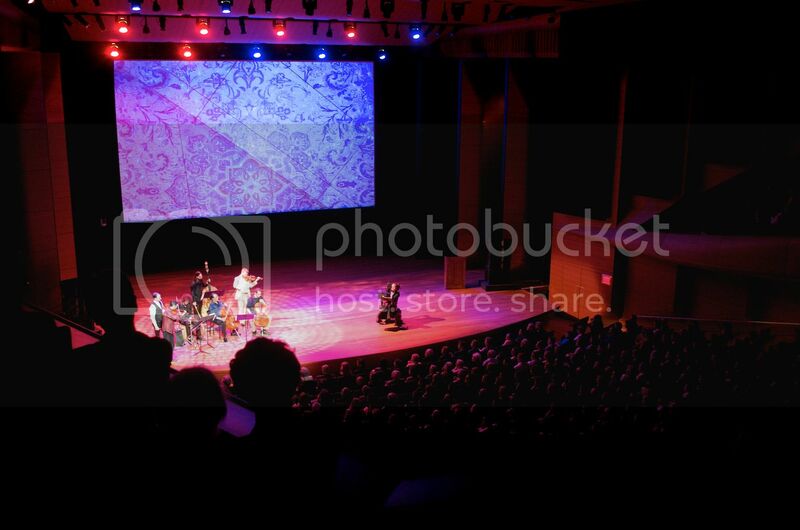 The grand venue played host to a number of luminaries, among them Alan Alda, Yo-Yo Ma, Kelli O’Hara, and the star of the evening, legendary physicist Stephen Hawking. Alda started off the evening. “It seems strange that with how much we know, how much is known about science, so little reaches us, the general public…” He continued, “Science is still obscured by a black hole of misunderstanding, and when light tries to escape, it gets drawn back in.” The World Science Festival’s goal is to “cultivate and sustain a general public informed by the content of science, inspired by its wonder, convinced of its value, and prepared to engage with its implications for the future.” Judging by the line up they have this coming week, they’ll do a great job of that again this year. A ballet performance at the opening gala of the World Science Festival 2010. The opening gala opening brought out a wide variety of people. From Nobel Prize winners to Broadway stars, the house was packed. Musical numbers all tied into the science theme. Broadway singers Rebecca Luker and Kelli O’Hara charmed the room, with “When the Sea is all around Us” and “Stardust,” respectively. Yo-Yo Ma and the Silk Road Ensemble played a lively Persian-inspired version of the Icarus story. Stephen Hawking looks on as Yo-Yo Ma plays a Persian-inspired version of the Icarus story. Undoubtedly, the highlight of the evening was honoree Stephen Hawking. Hawking has long been interested in bringing science to the public. Along with countless scientific publications, he’s written several books for the layperson, including his bestseller A Brief History of Time, and the updated A Briefer History of Time. His introduction this evening featured a clip of him from The Simpsons (He’s appeared in several episodes – tonight’s clip was from the Season 16 episode “Don’t Fear the Roofer”). Those who know Dr. Hawking spoke of his wit and humanity. His sense of humor came through in his brief remarks. Early this morning, just a block away from Times Square, a group of 21 lucky middle and high school students gathered to chat with astrophysicist Dr. James Mather. They were joined via video chat by students from Florida, Kansas, and students from two schools in Ghana who traveled more than 3 hours from their rural towns to participate. As the students prepared for the chat to begin, they wrote out and practiced the questions they wanted to ask with their friends. One young man approached Dr Mather in awe, “Oh my god, it’s such an honor to meet you!” “It’s an honor to meet you, too,” he replied. Dr. Mather is by all accounts a brilliant scientist. He’s the recipient of a 2006 Nobel Prize in physics, and is the Senior Project Scientist on the James Webb Space Telescope, slated to launch in 2014 (which is currently on exhibit in Bryant Park and which we will be bringing you video coverage of). He’s also a fantastic communicator, easily bridging the gap between high level NASA science and the inquiries of young students. As question after question came his way, he distilled his answers to clearly explain how the universe, and the tools we’ve built to understand it, work. This group of bright students from around the globe kept him on his toes, asking questions such as “How is it possible to have an infinite amount of space? What contains it?” and “What does COBE do exactly?” They asked about how cosmic microwave background affects society, and how scientists see back in time to look at dust from the big bang. He answered many questions with more questions, and did not shy away from saying he did not know some answers, an important aspect of being a good, inquisitive scientist. Dr. Mather explained to the students the mysteries of dark matter and dark energy, how we could use the presence of oxygen to detect other life in space, and the challenges they faced when they had to redesign the new telescope after the Challenger explosion, reducing the weight by half and finding a new rocket to send the now foldable telescope up on. 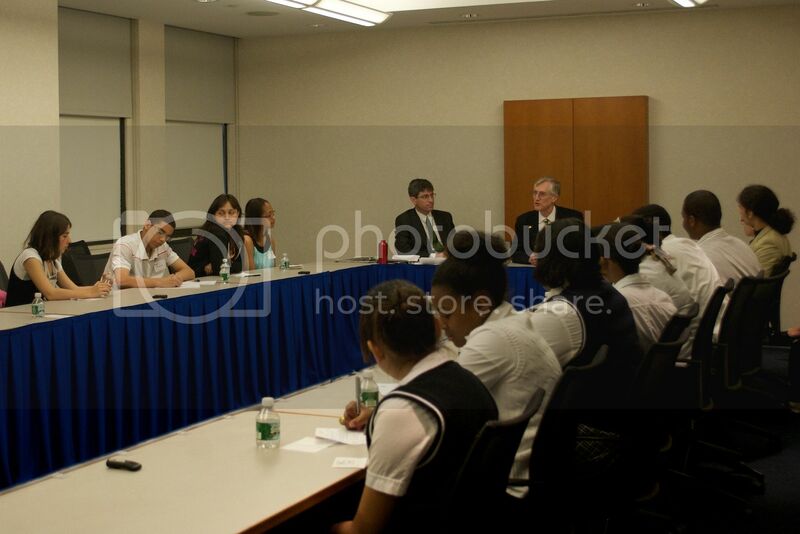 Dr. James Mather at a roundtable with science students at the World Science Festival in New York City. When asked “Did you ever think you’d be an astrophysicist when you were young?” Dr Mather replied “I didn’t even know what one was…” Towards the end, the conversation turned to how students could become scientists themselves. “You find something that interests you, and you follow it…Some people want to solve crossword puzzles all day long, and so they become experts at crossword puzzles… some people become fascinated with science, and they follow some special interest.” Mather continued, “Einstein wanted to know about compass needles. I wanted to know about stars… You just have to follow what interests you, and pretty soon you are led to, ‘I really want to know more math, because math is part of science’, and then ‘I need to know other parts of science that relate to my part of science’, and so, you just follow what you want to do, and try to get people to help you, and I see that everybody here already has had some help, because you got here. My impression is that there’s a lot of help available for people who want it, and if you say ‘I want to study science,’ somebody will say ‘I want to help you study science.’ So perhaps that’s the most important thing to know, that people want to help you if you want to do this.” He finished by telling the students to look him up and feel free to email him with more questions. As the talk concluded, the remote locations signed off, and the students in New York swarmed the front of the room, buzzing with excitement and basking in the attention of this true Pioneer of Science. Few medical issues are fraught with as much controversy as genomic testing. Will it lead to designer babies? Could knowing what’s in your DNA hurt your chances of getting insurance or a job? What would you do if you found out you had BRCA1, the “breast cancer” gene? Our Genome Ourselves (http://www.worldsciencefestival.com/our-genomes-ourselves) tackled all of these questions and more. Panelists included Francis Collins (Geneticist, Physician, & Director of the NIH), George Church (Molecular geneticist), and Robert C. Green (Neurologist & Epidemiologist), with moderator Richard Besser (ABC News Senior Health and Medical Editor, former acting director of CDC and Physician). All experts in the field of genomics, these four men offered both broad medical and policy knowledge, and a truly compelling panel presentation. Drs. 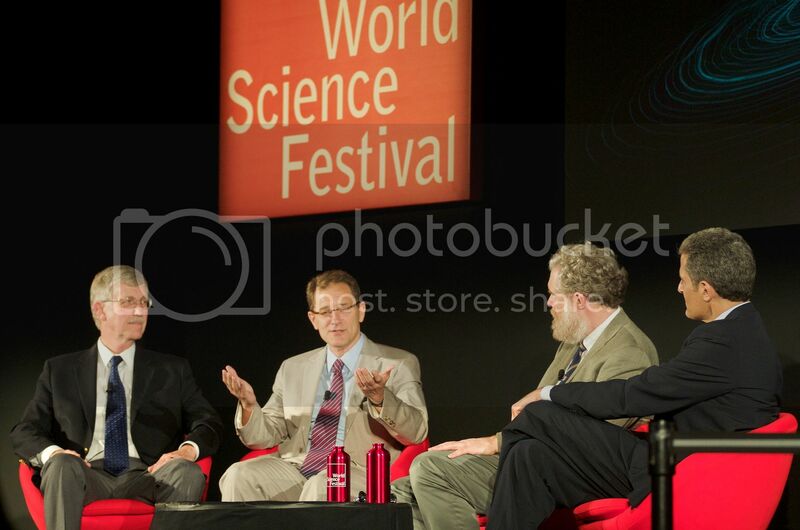 Collins, Green , Church and Besser (from left to right) discuss genomics at the World Science Festival in New York City. The biggest takeaway, repeated by all of the panelists, is that very very few genes are deterministic – that is, there are not many conditions that can be indicated or eliminated by the presence or absence of one single gene mutation. Each person has some 6 billion genes in each cell. The vast majority of traits and predispositions are caused by a combination of factors, many of which are not fully understood. We are still in the very early stages of being able to interpret what a sequenced genome might indicate – even if you were fully sequenced tomorrow, it would be very prudent to revisit the interpretation next week and next month and next year. The sequence of letters should stay the same (barring any typographical errors), but what they might indicate for your future could be drastically different, based on new information being found daily. Many people think that if they find out what their DNA says, they’ll have a road map for the diseases they’ll get and the life they’ll live, but in almost every case, that couldn’t be further from the truth. Without taking into account environment and other factors, we have a huge over-expectation of what genomics can tell us. There are other issues, too, beyond interpretation. Many emotional, ethical, and educational factors come into play. What about testing our children? At what point do they have the right to know they’re likely to get Parkinsons? Dr. Green wondered if it’s wise to give people results that say they have a 40% greater chance of a disease? What if that actually means their overall odds go from 1% to under 2%? A very important side question – do people understand statistics well enough to truly understand what risks indicated by genetic markers are saying? 1. What kind of risk is it able to provide you with? 2. What’s the burden of the disease? 3. Is there an intervention? The panelists agreed that as genetic testing becomes more prevalent, we need to provide proper training to medical professionals, whether that be physicians, physicians assistants, nurse practitioners, or others, to properly explain the meaning of the results to patients. We also need to improve and implement a solid electronic medical record system, so that the results can be applied. Minorities and other under-served populations need to be recruited to donate their DNA, which likely means dealing with the practicality of being able to promise privacy to those who are more skeptical than the original volunteers of interested researchers. Some of the bigger questions can be easily answered. For now, the idea of being able to go to a geneticist and selecting a tall, blue-eyed, muscular son, with musical abilities, athletic prowess, and above average intelligence, is out of the picture. Too many factors go into each one of those traits for it to be easily selectable – it’s currently impossible to optimize an embryo for those types of genes. The Genetic Information Nondiscrimination Act of 2008 provides a legal framework so that Americans cannot be discriminated against based on genetic information, as it pertains to health care and employment. As for what individuals will decide to do if they’re shown to have BRCA1, that will remain a personal decision. The first draft of the human genome sequence was completed on June 26, 2000. Twenty years later, we’ve come so far, yet still know so little. It will be fascinating to see what science achieves in another couple of decades. Follow the World Science Festival on Facebook and Twitter. All photography ©ScriptPhD.com. Please do not use without permission. Jessica Stuart is a writer, photographer and videographer living in New York City. Find her on her personal blog, and Twitter.